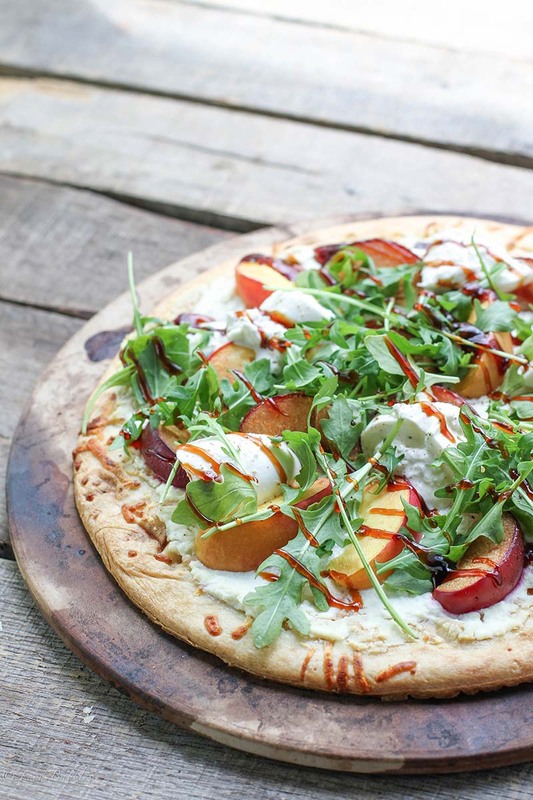 Golden dough topped with creamy ricotta, pickled peaches and plums, pepper arugula and fresh burrata. A drizzle of balsamic reduction is the perfect finishing touch to this summer pizza recipe. In a large saucepan, bring vinegar, sugar, spices, garlic, thyme and 1 cup water to a boil. Add fruit and stir a few times. Remove from heat and set aside. Let cool completely. Strain and discard liquid. Place in an airtight container and refrigerate until ready to use. attachment to a dough hook and knead until smooth, about 5 minutes. Place dough into a greased bowl and cover with plastic wrap. Set at warm room temperature until puffed and doubled in size, about 60-90 minutes. into a large, thin circle on a lightly floured surface. Brush dough with olive oil then spread 1 cup of ricotta cheese over dough. Top with half the peaches and plums. Bake in preheated oven on pizza stone for 15 minutes or until done. Remove from oven. Top with desired amount of arugula and half the burrata. Drizzle with olive oil, balsamic reduction and sprinkle with freshly cracked black peppercorns and sea salt. Repeat with remaining ingredients for second pizza. Recipe created by Food Babbles.